MARGAO: A complaint was filed in Colva regarding illegal mining of sand and encroachment on River Sal by the operators of one Mobor Fisheries Ltd. Sand from the banks of River Sal was filled in more than 200 sacks to build a temporary retaining wall along the river Sal in Mobor. The complaint was filed by one Raul Rodrigues, who claims to be one of the owners of the land. Interestingly, he claims that the Mobor Fisheries is operating on their land without any lease and that the matter is in court. However, this issue with Mobor Fisheries appears to be just a tip of the iceberg. Iris Rodrigues, a local of Cavelossim, informed that Mobor Fisheries has no permission from CRZ, Pollution control board or any other department. Rodrigues also informed that nobody is monitoring the activities inside his property and nobody knows where from the boats come when they dock at Mobor Fisheries; besides fish, what legal or illegal goods they get into Goa via the trawlers which dock at the jetty. “All we know is that trucks ply at night. If anything illegal goes on in the property or if some crime is committed in the property, the police and other authorities might blame me since Mobor Fisheries is occupying the place without our permission. They will be able to do any illegalities and disappear overnight,” he said. The complaint filed against the sand extraction has been forwarded by the Colva police to the Colva panchayat, Deputy Collector, Director of Mines, Captain of Ports, GCZMA and Health Department. 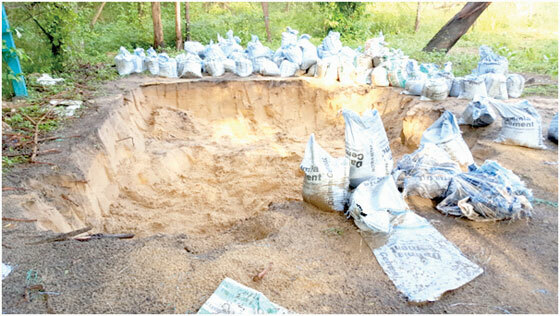 After the complaint was filed, the operators of Mobor Fisheries have covered their tracks with sand taken from an unknown location and dumped at the site inside the property from where the sand was initially extracted.